If someone had told me, 10 years ago, that I would be writing about grief, I wouldn't have believed them. At the age of 38, after years of struggles, my life had finally fallen into place. I was happy and fulfilled. My life was perfect. 2006 is the year I lost my husband in an airplane accident. I was completely unprepared for the anguish I found myself in. I didn't know how to live without the love and strength of my husband. I sank into a deep despair that seemed to engulf my life within a dark shroud. Everything was a struggle. I had never felt so hopeless. After a year of barely surviving, I slowly began to repair my life and my family. I still remained sad and in pain, but I was able to start to find some joy again. I had survived, but I would never be the same. I thought that losing my husband was the worst thing that could ever happen to me.....but I was wrong. In 2008, my 20-year-old son died of complications from kidney failure. This time my grief looked very different and I was completely unprepared for the enormous expanse of emotions that I experienced. I was experiencing moments of a mother's panic. Where was my son? Was he safe? Was he afraid? My maternal drive to protect him was still so strong, that at times, I felt as if I would lose my mind with worry. Other emerging emotions were anger and resentment. How could this have happened? What had I done to deserve losing both my husband and son? It felt as if I was being punished, even though I had lived by all the rules. My anger at times was white hot and I could almost feel the heat of it radiating out from my body. It took everything I had to keep the anger contained. But, contained anger turns into resentment. I felt resentment against life, God...resentment against everything and almost everyone. I became skeptical and bitter for several years. I no longer recognized my life anymore, or the person I saw in the mirror. My unresolved grief turned into complicated grief and I struggled to keep up with life for many years. It took years of personal and spiritual searching, along with professional help, to pull me out of the unrelenting pain, and to finally get me to a place where I was able to find some happiness again. My wish, after going through all of this, is to bring awareness to other grievers that they are not crazy for experiencing all of these emotions. Losing someone who was such an important part of our lives is the hardest thing we will ever go through. We must go through a process of learning to live without them, and to get there, we must learn to work through all of these emotions. This is hard. Grief is hard. Our lives will never be the same after the death of someone we loved so dearly, but, it is possible to learn to live your life again. I believe that our society sets us up for failure when it comes to dealing with death and grief. Death, illness and grief are not acknowledged in our structured and categorized Western lives. If they do happen, they are something we are supposed to somehow fit in, while we continue juggling our every-day lives, completing our grieving within a reasonable amount of time, and getting on with life without unnecessarily disrupting anyone else's life. Grief is a messy and chaotic process that doesn't always go in the orderly fashion that society expects. Most grievers are not prepared to deal with all of these complex emotions. We start to believe that there is something wrong with us. Not only are we confused by what we are going through, but others around us don't understand either. All of this combines and makes us feel like it is possible that we are going crazy. We are not crazy. We are grieving, and at times it feels that we are fighting for our very survival. Society doesn't understand our struggle and seems to believe that grief is a fairly simple process; grief makes you sad. After the griever has experienced the appropriate amount of sadness, they will 'get over it', and resume living life. The stark reality of grief looks very different than society's perceptions of it. The truth is that when grieving a substantial loss, we will experience very complex emotions, while we move through the painful and difficult process of grief. There is so much more to grief than just sadness. Grief will drag us through a vast expanse of emotions: Fear, Shock, Guilt, Anger, Irritability, Despair, Regret, Anxiety, Loneliness, Denial, Resentment, Yearning, Sadness, and Resentment, being just a few. The scope of possible emotions is almost endless. These emotions, if not acknowledged and eventually worked through, can pull us down into the quicksand of grief like weights attached to our ankles. Every griever will experience different emotions, at different intensities and varying lengths. 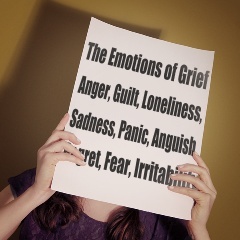 The grieving process is very subjective and very personal. Regardless of what society expects of us grievers, our hearts and emotions refuse to follow the binding and difficult constraints and timelines placed upon us by society. Grief demands that our emotions and heartache be adequately attended to, honored, and healed, before we are allowed to move on. There is no wrong or right way to grieve. There is no time limit to grief. Once you have lost someone who meant the world to you, you will never be the same. You can eventually learn to live with the void in your life, and you can learn to live with joy again, but life will always be different. This is the reality of grief. Don't allow society to put your grief into a narrow box. Honor your grief. Honor your Loss. Be gentle with your broken heart. Pain and loss will change you, but they don't have to define you.